GoHz solid state frequency converter is a standard AC power supply electronic device, it can simulate international standard power supplies, convert fixed AC voltage and frequency power into stable pure sine wave power by internal AC to DC, DC to AC current rectifying procedures. 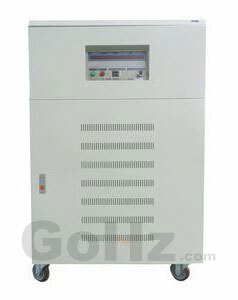 GoHz frequency converter is suitable for use with resistive, capacitive, inductive and non-linear loads. Adjustable three phase 0 to 520VAC output voltage. GoHz frequency converters are equipped with electronic circuit/instant trip breaker/buzzer alarm for over voltage, over current, over temperature, output short circuit protection. Contact us if you have specific requirements.